As a part of this year’s Seattle Design Festival and in contribution to our hosted panel discussion called “Urban +: Adding Density while Retaining Character, b9 architects progressed on our research on Urban + by examining Seattle’s current zoning, explicitly looking at opportunities in Single-Family zones with Wallingford Residential Urban Village as our case study area. Visit this page for updates post-panel discussion. Seattle’s zoning code governs the use and development of land in Seattle. * It determines not only what and where types of structures can be built, but also the density of dwelling units and businesses throughout the city. Areas of more intensive development are focused in designated Urban Centers, Hub Urban Villages, and Residential Urban Villages. Wallingford and South Lake Union are two examples of these areas and generally walkable communities that are well served by amenities. *All data is derived form the City Of Seattle data portal at https://data.seattle.gov/. 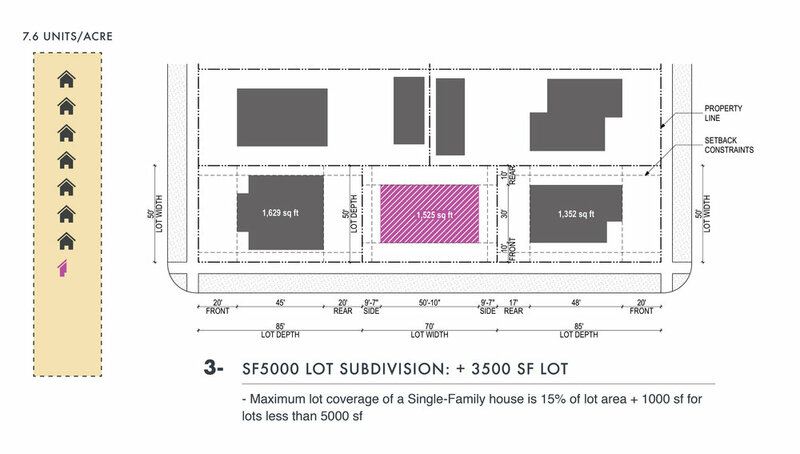 Specific files used for these calculations are; “City Of Seattle Zoning” (Updated 2018), “Zoning Density Assumptions For Zoned Development Capacity Model” (Updated 2017), and “Capacity For All Parcels 2015” (Updated 2017). With this information in mind, we then examined development opportunities in Single-Family zones, choosing the Wallingford neighborhood as a case study, due to the significant amount of Single-Family zoning in the neighborhood’s Residential Urban Village. 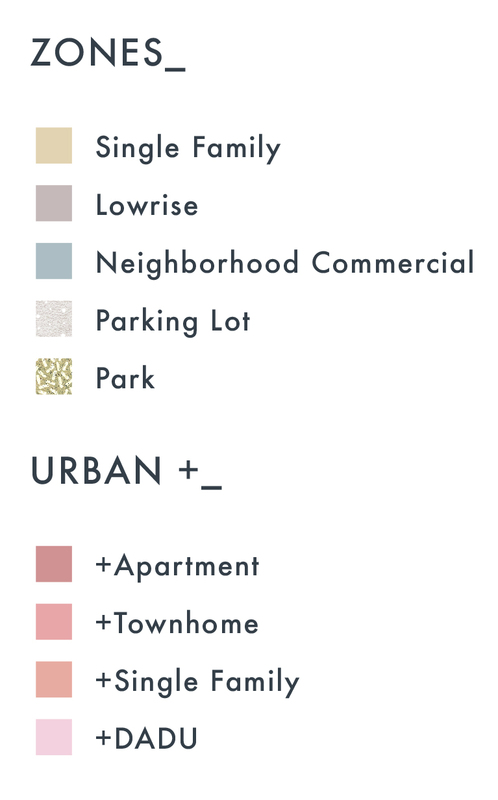 Though a key goal of Seattle’s Urban Village Strategy is to “Increase residential and employment densities...” within its villages, Wallingford’s Residential Urban Village remains predominantly comprised of single-family homes, which accounts for between 50-75% of its total land use. 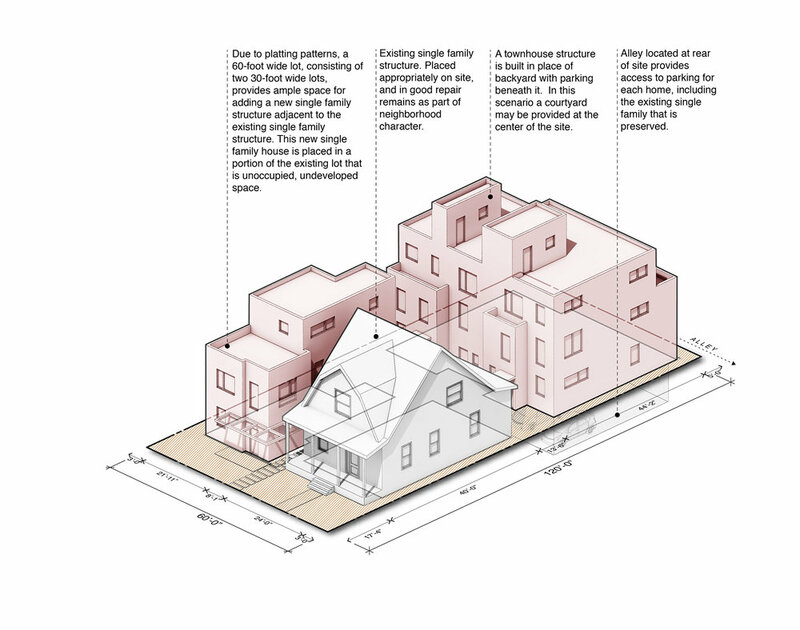 This research explores the possible densification benefits of re-thinking the ends of blocks. Examples here introduce a variety of block-end development solutions to the portions of the Wallingford Residential Urban Village currently zoned Single-Family Residential. 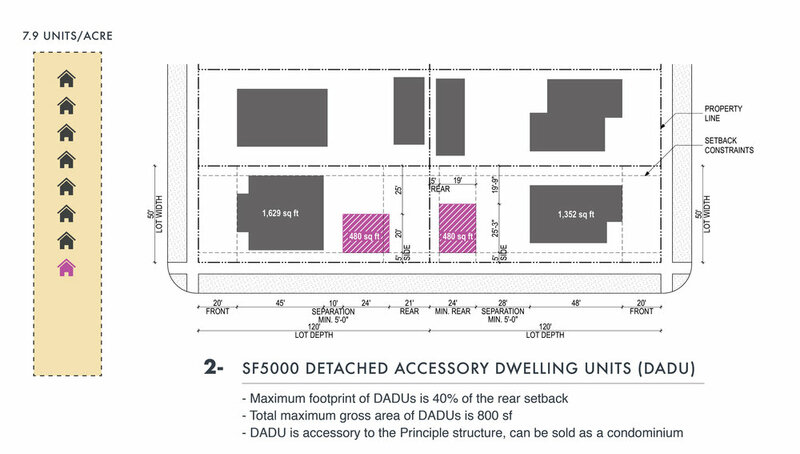 This strategy suggests that units can be added to corner lots while the interior of residential blocks are allowed to retain their current residential fabric. Moreover, this strategy presents a possible incremental approach to densification upon implementation of MHA or similar up-zoning in the area. Precedents such as this, set in a neighborhood like Wallingford, can provide examples for strategic densification in other predominantly Single-Family neighborhoods throughout Seattle. The following iterations to the right are feasible strategies for adding units based on lot conditions and zoning. 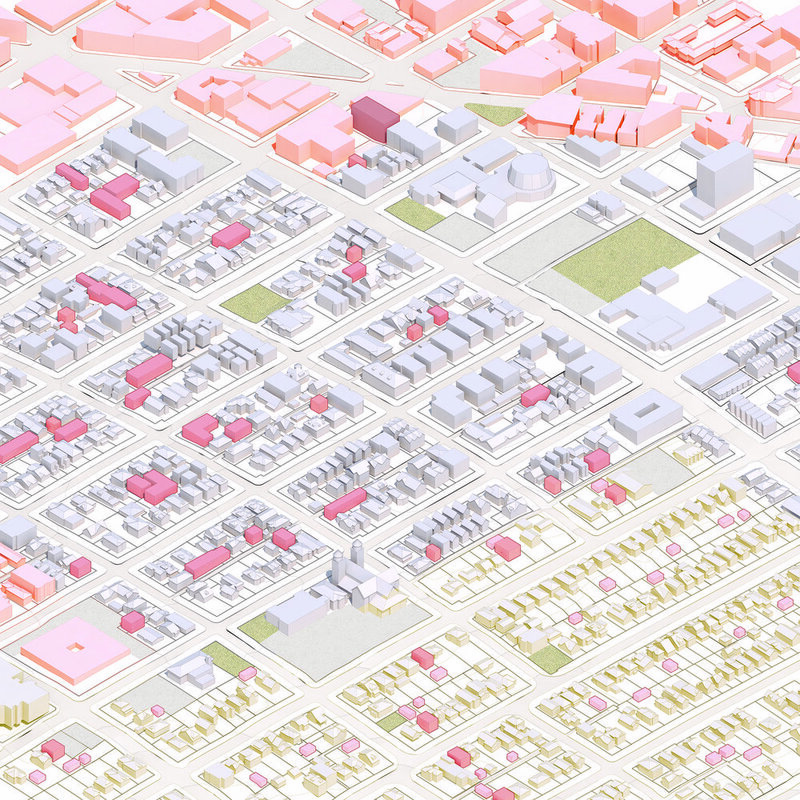 The major factors in land use code that determine building footprint* are lot coverage and yards for Single-Family zones, and FAR (floor area ratio) and setbacks for Lowrise zones. *The building footprints represent general potential building area on the lot. They do not factor in design and modulation. **In land use code, the distance between building structure and property line is called a yard in Single-Family zones and setback in Lowrise zones. Thanks to everyone who joined the discussion! 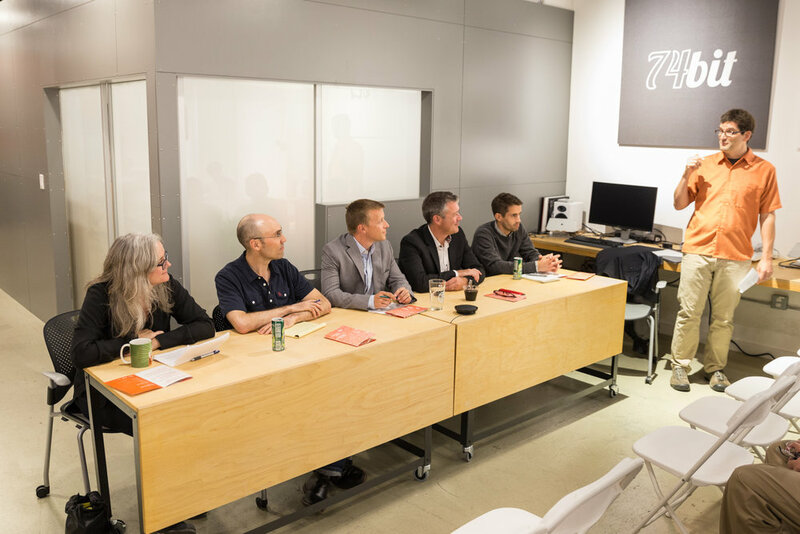 The event was engaging, insightful, and relevant for both the public and the design community. A special thanks to David Neiman for moderating and our stellar panel - Josh Bower, David Cutler, Gabriel Grant, Cary Moon, and Nick Welch. Is Seattle's current zoning code preventing or encouraging positive growth in Seattle? What actions can developers, architects, planners, politicians, taxpayers do to create positive change in Seattle's growth - urbanistically, demographically, culturally, and spatially? Where are there areas of potential innovative ways of growth and change, pertaining to housing and zoning? In participation of this year's Seattle Design Festival and Design in Public’s year’s theme of “Design Change,” b9 architects is excited to host a panel discussion on the relation between housing and zoning in terms of Seattle’s current growth. 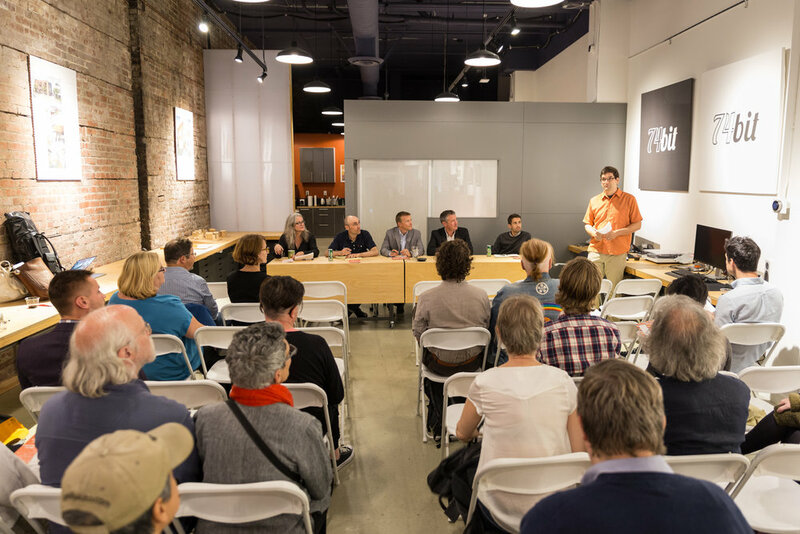 Through both a moderated conversation with our esteemed panel and the opportunity for an open dialogue about Seattle's rapidly changing urban fabric, we will delve into issues of zoning, density, value, and change. We invite you to join the conversation about how to create positive change and growth in Seattle! Please join us at b9 architects as well as a diverse panel of architects, developers, educators and more for a discussion about the relationship between zoning and equity here in Seattle. In the meantime, feel free to stop by our storefront and experience our exhibition, which addresses the connection between zoning and equity.